A 13th-century church with an imposing west tower. The corners of the tower each bear a statue, traditionally said to represent kings. While two of the kings, William the Conqueror and King Harold, might not be thought unusual for an East Anglian church, the other two seem odd. These latter two kings are said to represent Macbeth and Malcolm, Kings of Scotland. 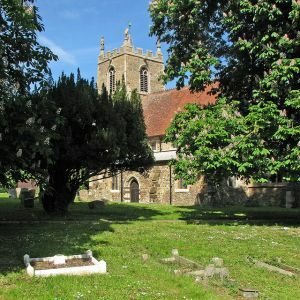 The presence of the two Scots might seem peculiar in a Cambridgeshire church, but each man also bore the title of Earl of Huntingdon, and Abbotsley formed part of the old county of Huntingdonshire. Malcolm was also married to Margaret, who was canonised in 1250, adding a further connection for a church dedicated to St Margaret. We do not know for certain that the church is dedicated to the saint who was Malcolm's wife - there are at least 8 saints named Margaret - but it does provide another reason to suppose that Malcolm is one of the kings represented atop the tower. The interior is most notable for the ornate tomb recess for the Tilley family. The Tilleys owned Abbotsley manor from 1312 and may have been responsible for building the church as we see it today. We do know that there was a church here before then; records suggest a building as early as 1138. That church was subject to a dispute over ownership and was eventually awarded to the Abbey of Jedworth in 1272. The earliest parts of the current building, including the chancel arch, may date to this period. The octagonal font is also 13th century. The interior was greatly restored in the Victorian period by Butterfield, but the restoration was sensitively done and the church retains much of its historic feel. While the church is in the care of the Churches Conservation Trust, the chancel is still used as the parish church for Abbotsley.